After a quick stop at the gelato and espresso counters at Eataly we were ready to walk across Madison Square Park to the newly opened Museum of Mathematics. 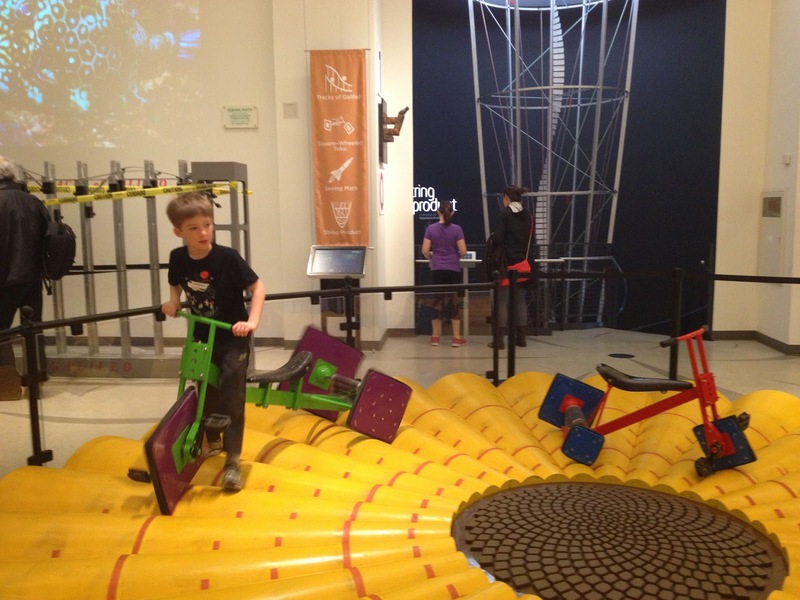 Created by a hedge fund mathematician turned millionaire, the museum is a giant playground where your kids can play and explore, completely oblivious (or not, up to you) about the math going on around them. The museum opened in mid-December and on our April visit there were a few exhibits still being worked on. The volunteers were super helpful explaining some of the algebraic concepts to the little C&Gs but mostly they just had fun figuring things out. The first floor has the tricycles where you pedal the square wheels over the bumpy circular track. I couldn't explain how it works, but it does, and the volunteer would be happy to explain it in very simple terms to your youngsters. We also went for a quick "sail" in the rowboat as it glided along on top of acorn shaped balls. We didn't feel a single bump as we pulled ourselves along, despite the variety of smooth and hard edges on the acorns. 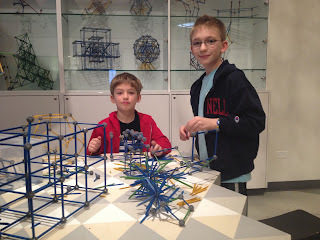 The building toys "Zome Tools" were a big hit and we spent a long time constructing dodecahedrons, DNA, and a ferris wheel. This scientific version of classic Tinkertoys, Zoom Tools were easy to manipulate and turn into all kinds of shapes, even if all I could manage was a large box. We totally lucked out when a hovering Australian tourist turned out to be a vacationing high school physics teacher. He talked to Big C&G about the soccer ball he was making and added a whole bunch of new words to his (and my) vocabulary. Downstairs at "MoMath" is a giant digital floor with colored lights that change as the kiddos run and jump around it, showing the shortest distance between each person as they move. The "Human Tree" digital screen turns your one child into a multi-child branched tree, complete with leaves growing out of their hands. The boys spent another good half hour at the "Tesselation Station" using interlocking monkeys, rabbits, and other shapes to cover the wall with colorful patterns. At the "Enigma Café" in the center of the lower level there are tables set up with games and brain teasers for you to try. One table had a Rubik's cube, and if you're stumped the volunteer will solve it for you in little more than a minute. 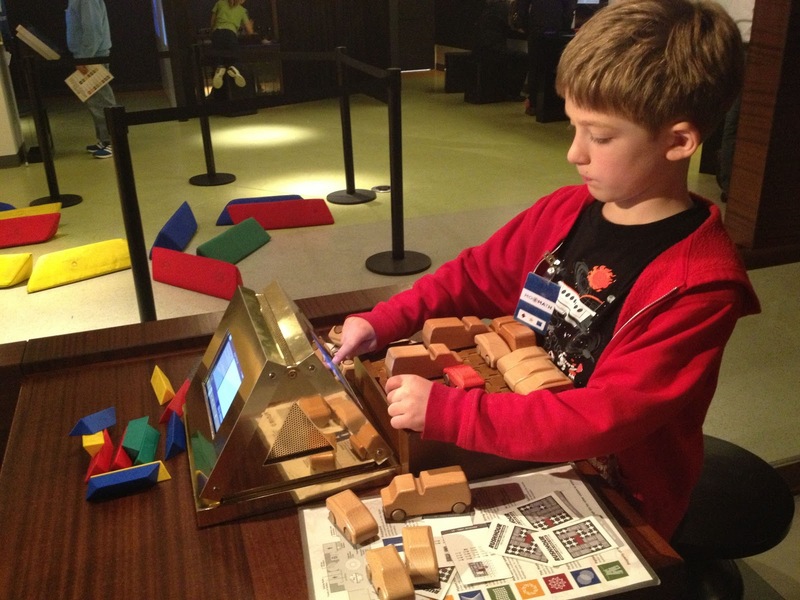 We had fun trying out all the games we usually see in the brainy section of our toy store. Now if they just served cocktails tableside . . .
We were all pleasantly surprised at how much fun the Museum of Mathematics was. We must have spent almost 3 hours there, and there were plenty of exhibits that we pulled the boys away from after about half an hour. It was mid-week (thankfully not during NYC school vacation) and we had the place mostly to ourselves. I'm sure the boys missed a lot of the abstract concepts but the important thing was they had a lot of fun and some of the ideas will surely stick with them. After all that "learning" we were ready to meet up with the C&G Grandparents for some much needed cocktails. Up Madison Avenue on our way to Grand Central Station we stopped in at the Carlton Hotel. The chic art deco hotel has a lovely lobby bar, complete with comfy leather couches and a very knowledgable bartender. He didn't have a cocktail menu (he said he was working on a new one) but he had some good suggestions for Mr. C&G and the Grandparents. I went with my Italian themed Aperol Spritz, just the keep the Eataly vibe going. 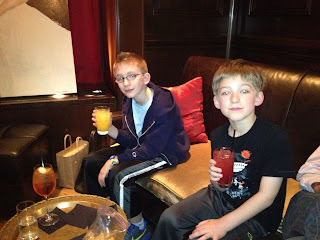 I've found that hotel bars can be very accommodating when it comes to cocktail hour with your kids. At 4:00 the bar was pretty empty so the little C&Gs had the run of the place, exploring dark corners of this classic old hotel that dates back over 100 years. The little C&Gs were happy to wrap up their big day in the city with a few Shirley Temples and some bowls of snacks. The Museum of Mathematics is on the north side of Madison Square Park (great playground and a Shake Shack) at 11 East 26th Street. They're open daily from 10:00am to 5:00pm, tickets are $15/adults and $9/children and you save a little money if you buy them online on their website.